I wanted the focus to be on her eye. See the dirt on her hat? 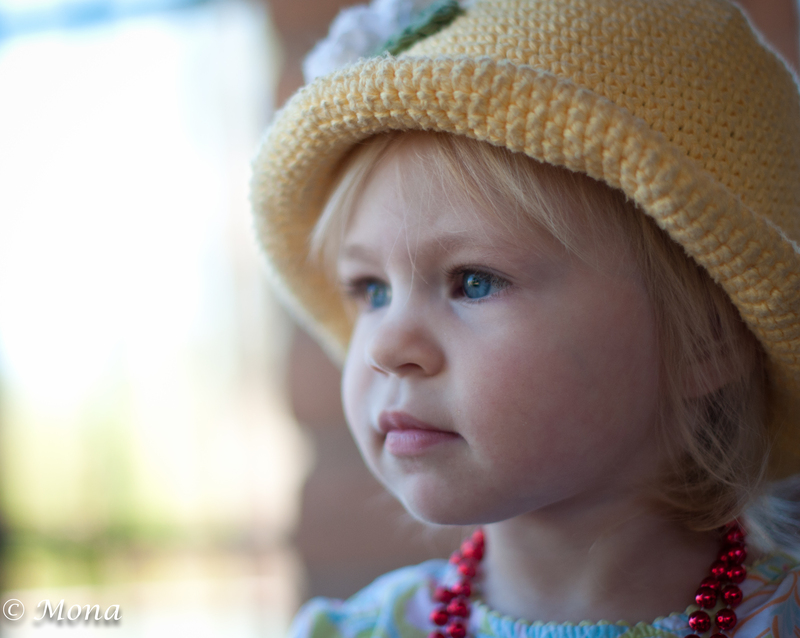 That’s because she just loves wearing this yellow hat & I love photographing her in it. Notice the wispy hair in her eyes? She has not yet had her 1st haircut. So cute, grandma! I can see the dirt I am sure she also sleeps with this hat om in she can. Being the person I am, I am itching to wash it, but long ago I vowed to not impose myself on my daughter-in-law. Besides, in a way, I think it lends a bit of character. She is the delight of my life. What a stunning photo of this angel! Kudos! Thank you so much. She is fun! She’s gorgeous and you take fab photos! Love the colors and textures.. Thanks. I love the bokeh effect with that lens, which I haven’t had very long. She is the best…and smart too…I bet. She is the only toddler I know at the moment, so she may just be pretty average. However, my MY mind, she’s brilliant and talented. What a precious little child. She photographs beautifully. Thank you for sharing. She is focused. She does photograph beautifully and is quite comfortable in front of the camera. I suppose we like that when young and then become self-conscious somewhere along the way. Perfection! The image and the model! Thank you so much. I have so much fun with her.